Of all the reviews I have done, this was perhaps the most difficult assignment. Let me state up front that I am a hunter, not a shooter. I value the dog work perhaps more than the actual harvest. It’s a different perspective, and I found even reading about the British shoots somewhat tedious. Perhaps an explanation is in order. The typical British shoot involves beaters on wooded hillsides flushing pheasants (or other gamebirds) down to guns waiting on stands placed in the valleys. The emphasis is on high-flying birds and on large quantities of (expensive) birds. As such, it is by necessity a sport of the "rich and famous" and the importance of the various shoots seems to be evaluated by the station of life of those participating. "Although its pheasants were not always among the very best, Blenheim in Oxfordshire has long been in the ‘super league’ by virtue of its associations with the rich and famous." 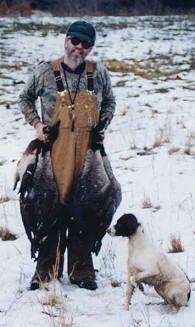 However, there has always been an interest in this sport, a cousin to hunting, and its longstanding traditions. And with the requirements of large portions of managed gamelands, and released birds, perhaps it forms the basis of pheasant "hunting" in Britain, the home of many of our spaniels. Be forewarned, although the cover of the book features two springer spaniels in its illustration, it is not a book about dogs or dog work. The first section of the book addresses some general background information about the shoots. I found the sections on the game, and the gamekeepers to be the most interesting. There is a lot of work required to sustain the high volume of pheasants required for a successful shoot. "Indeed it was at Hall Barn on 24 January 1910 that he (Edward VII) enjoyed one of his last few outings, having had what he described as one of the best days he had ever known, shooting 2,400 pheasants with the Prince of Wales, Prince Albert of Schleswig-Holstien, Count Gleichen, Lord Ripon, the Hon Harry Stoner and Sir Charles Cust." The bulk of the book, divided into geographic regions, discusses the actual venues and operating policies of the various shoots in England, Wales and Scotland. Some of these shoots have histories that go back for centuries. The book is replete with reproductions of old gamebook records, and many old and valuable photographs. Martin, who is known as an accomplished country and natural history writer, was an editor at The Shooting Times for many years. As such he had access to many of the private shoots in a way that few others could have. The book was originally published in 1987, but the second edition includes revisions made in 2007. 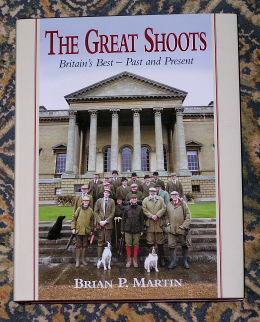 For those with a keen interest in the shooting sports, it would be a fine high-quality addition to your library.